I love this sandwich. I could eat this everyday. It’s not the fastest sandwich to make because it involves roasting, but that’s all downtime, so who cares, right? Slice the tomatoes in half and place them cut-side up in a baking dish. Sprinkle with a generous pinch of salt and 2-3 tablespoons of olive oil. Roast for 70-80 minutes. 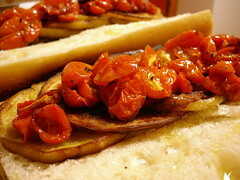 Once the tomatoes are in, prepare the eggplant. 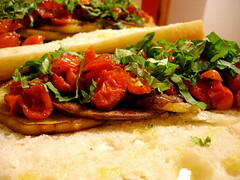 Slice the ends off the eggplant and peel off the skin with a vegetable peeler. Slice widthwise into quarter inch thick circles and place on a baking sheet in one layer. Sprinkle with a generous pinch of salt. Drizzle about 1/2 cup of olive oil (or more. for serious) over the slices. Bake in the oven for 35-45 minutes depending on how thick your slices are. 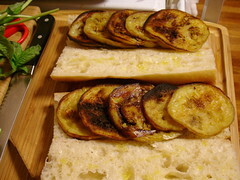 The eggplant should be soft and browned. 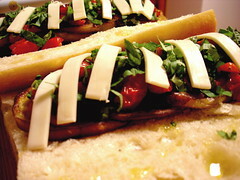 Place sandwiches, open faced, into a 400Âº oven for 5 minutes, until bread is crispy and “cheese” is melted. When they come out of the oven, fold the top over and press down – the olive oil will soak into the bread and form a natural “dressing” for the sandwich. GREAT! I will try this!! I am looking for a good vegan cheese, I will try the Tofutti Cheese. Hehe – but be warned! This cheese is really only good in small quantities and with something else. Follow Your Heart Vegan Gourmet Cheese is a little better as an all around cheese, but I like them both for different things. 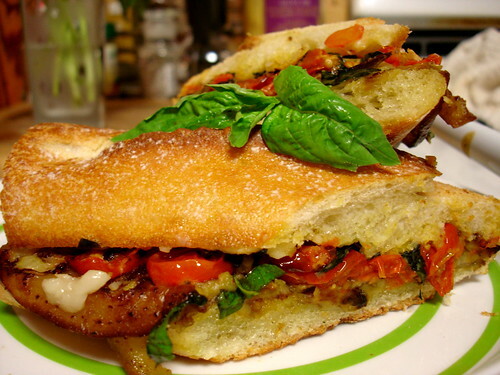 That looks like one of the most beautiful sandwiches I have ever seen!! This sandwich is awesome!!!! My daughter and I have been eating this all weekend and don’t seem to be letting up any time soon!! Any idea where I can get my hands on tofutti cheese? I live in San Francisco and every place I’ve gone doesn’t have it. (Of all things!) Is there a site that sells it, per chance? Looks good. Tried making it, but after 60 minutes at 350 (F), the tomatoes were pitch-black. I wonder what happened. I made this and it turned out great. I made this for my boyfriend and we both LOVED it! Thanks for the recipe and I would for sure make it again!